Have you every been in conversation with God when you receive a message so clear that it sort of makes you stop and say, "Is that you, God?" I had one of those moments today during my morning prayer. Except for one thing. There was no doubt. I didn't have to ask, I just knew. I always pray for peace. That our world leaders will wake up and work toward peace. That we choose the right leaders for our country. An end to fighting. That our soldiers - all soldiers - return home safely. For Darfur. For my sponsored children in Chad and Malawi, for Iran, Afghanistan, you name it. But this morning was a little different. The concept of "if you want peace, you need to work at it. "Pray for Peace. Work for Peace. Live Peace" was very prominent. I can't explain to you how it was conveyed to me. And I finished my prayer knowing that I was going to - I was commanded to - share this with whomever would read/listen. And let me just say, it's nothing like the heaven opening up, actually the concept is so simple you'll probably not think it's that profound, but receiving it, it really was! So here it is. I was thanking God for hearing my prayers. So many people that I have been praying for are doing so much better and I'm so thankful. I was thinking about why those prayers were answered yet we are so far from peace. Maybe it's collective prayer: in these instances, many are praying for the afflicted. And because we are praying, we are living the prayer, daily, we're aware of that person's issues. We call them, we care about them, when we see them we are genuinely happy and go up to embrace them sharing our concern. And then when healing takes place, it's evident, sometimes tangible. What about vegetarianism? It opens that door for me to think about. If I'm going to live in peace, is the killing of animals keeping me from living in peace? I haven't decided that one yet, but inside, I know that it's true, right? It's my own pleasure that I'm seeking when I say, "yeah, but...."
This was the clear message. We have to pray it, believe it -- correction -- "I" have to pray it, believe it and live it. I have to keep it in the forefront of my consciousness. If I want it as bad as I say I do, then I have to work for it (just like weight loss, walking 39 miles, like anything!) It has to be a top concern because without peace, there is no future. That's the message I got today. Pray for peace. Believe in Peace. Live Peace. Today I will take steps toward peace. I want to think about this more in the coming days, weeks, months ahead. I would love to see a world of peace and love replace the hatred and violence. I think working together, we can achieve it! What are your thoughts? I would love to hear from you. 39 Days til the Wedding! 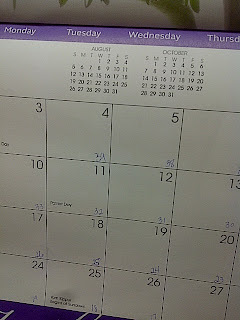 Today is September 4. 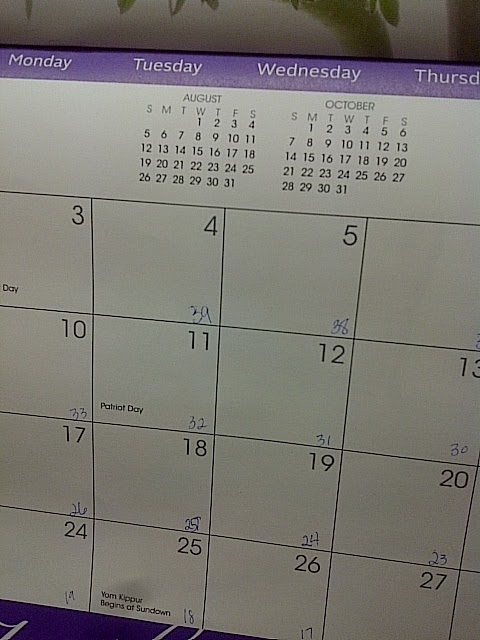 I'm back to work after the long Labor Day weekend, and I flipped my wall calendar to September , did a little backward count from the wedding date to today and was surpised to find that we're officially in the 30's...with 39 days to go til Ani and Eric's wedding. As Mother-of-the-Bride, there are a lot of emotions roaming around inside me: excitement about the upcoming wedding, panic about forgetting something major I was supposed to do, anxiousness about getting deadlines met, things done, melancholy about missing my daughter, etc. You get the idea. I have been actively praying for the past couple of months. I mean, close-the-door, on-your-knees, private-time-with-God prayer. And I'm pretty sure that this is what has been helping me keep it together. One of the things that I pray for daily is "focus"...Focus on the true meaning and sanctity of Ani and Eric's wedding. I pray that God gives me the ability to not get so caught up in the excitement and details that I forget what is truly important: the holy sacrament of marriage. Don't get me wrong. We're still running around and doing all the fun stuff. We're meeting up today after work to check out make up at Sephora, and deal with bridesmaids' gifts. And I'm enjoying every minute of my time with my baby girl. But inside, I'm sensing a different calm inside me. A calm that I know is coming from that focus that I've asked for pairedwith the realization that everything is going to be beautiful and blessed regardless of how we wear our hair, or what our shoes look like. We're in the 30's. And it's September. A lot of great things are coming up this month. Ani's bridal shower; the 39 mile Avon Walk for Breast Cancer; final fittings, and wrapping daros for the wedding. I will keep praying. For strenghth, for focus, for peace and that God bless our children with a happy and peaceful marriage.